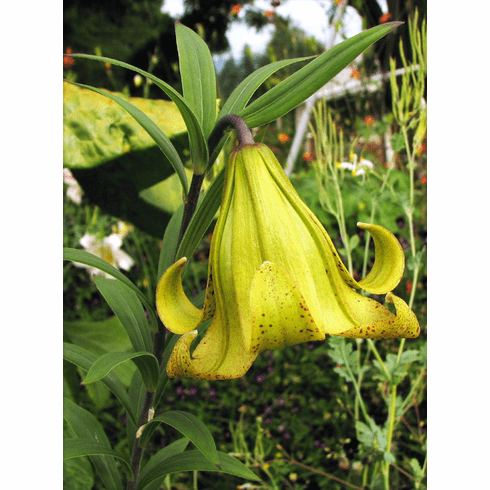 A native to Burma (Myanmar) and named for its discoverer, the English botanist John G. Baker, Lilium bakerianum has a wide distribution and is quite variable in color ranging from greenish-yellow to green, to dull olive to olive-brown. Woodcock & Stearn's Lilies of the World groups it with at least five color variants. Best suited to a cool greenhouse, in nature it has been found at elevations of 10,000 feet or more in the Himalayas where it flourishes. Bulbs rarely last more than two to three seasons under cultivation. The flowers are ivory-white to light yellow, flushed in green on the outside, and are heavily spotted in red-brown. They are pendant in form and are held on 2 to 3 foot stems. Stems can wander for two feet or more underground before emerging. We thank Gene Mirro for his contribution of the beautiful profile and open throat photo views of this rare lily which he has flowered successfully. Gene reported this lily grew well for him in an open garden in SW Washington. Photo provided by Gene Mirro. Copyright Gene Mirro, all rights reserved. Used with permission.